Nine Twenty are passionate about developing our workforces of the future, and as a result have forged close links with many worthwhile initiatives. Karen Stewart, our Managing Director of Engineering & Manufacturing, has been closely involved in these initiatives, and loves nothing more than seeing a child’s eyes light up when they realise what opportunities there are in the industry, and then go to on achieve their ambitions. Karen has been working alongside SmartSTEMs, which is a registered charity that acts as the glue between tertiary education, industry and schools. They exist to provide equal opportunities to young people into STEM (Science, Technology, Engineering and Mathematics) with particular focus on the gender gap (they run both all-girl and co-ed events). The model is scalable and replicable, and delivered through their intertwined initiatives of hub events and outreach. 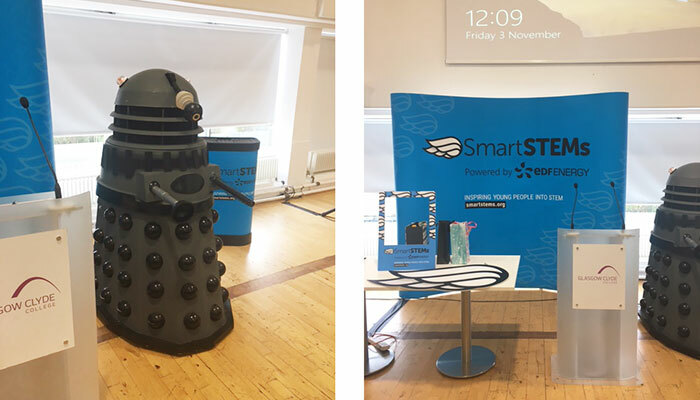 Hub events are held in tertiary education establishments, where they work to unite industry and schools in applying the SmartSTEMs glue and get the great people of Scotland connected and collaborating to best effect. Outreach is delivered in schools and clubs affording STEM activities locally & ongoing, and the charity collaborates widely to deliver maximum impact. They are delighted to pull together many wonderful industry partners and scores of generous volunteers to deliver this great event for these young boys and girls, and they are proud to be playing their part in making Scotland a great place to discover and pursue STEM careers.